Our Independent Living Units are designed with care, with senior adults in mind. Residents are fully self-reliant, yet the safety and security of Lakeview Manor and its staff are close by. Each 1,000 square foot, unfurnished unit features 2 bedrooms, 1 ½ baths, spacious living room, and kitchen. Appliances include a refrigerator, dishwasher and oven. The laundry room comes complete with a washer and dryer. Well lit, beautifully landscaped and maintained grounds. 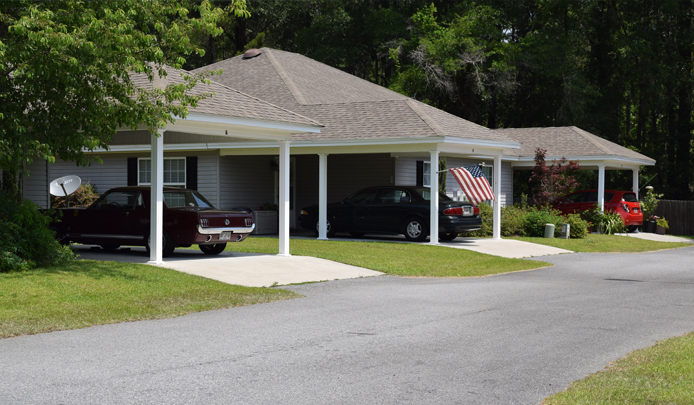 Carports at entrance to each unit. Emergency call button in each unit. One meal daily at Lakeview Manor, in our family-style dining room. Residents are given a monthly “Calendar of Events” and are encouraged to attend any programs or activities that may be scheduled. Residents are checked on daily. Since all independent living units are unfurnished, you will need to bring your own furniture. All units are cable-ready, but there is a small monthly fee. All units are wired for telephones, but the phone bill is the responsibility of the resident. The electric bill is the responsibility of the resident.